rom a growing band of small producers, Austria provides the world with outstanding dry whites, superb sweet wines and ever more interesting, good quality reds. Yet international recognition and appreciation of the great strides made has been slow in coming. From the steep hillside vineyards above the Danube (Donau) come the great Rieslings and Grüner Veltliners of the Wachau, as well as from the neighbouring regions of Kremstal and Kamptal. Around the Neusiedlersee, a broad shallow lake in the east that extends into Hungary, are spread the vineyards providing the grapes for the outstanding sweet wines as well as much of the raw materials for the current revolution in red wine production. The WACHAU is the leading wine region of Niederösterreich (Lower Austria) and together with Kremstal and Kamptal produces the majority of Austria’s top dry Rieslings and Grüner Veltliner. 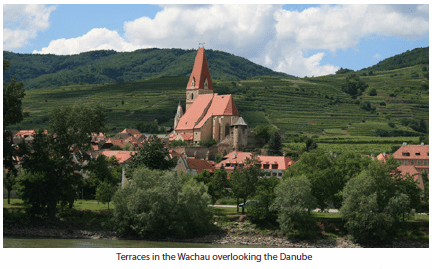 Wachau’s Rieslings are generally much closer in style to Alsace than Germany; full and powerful, with a marvellous concentration and purity of fruit within a vibrant structure. The very best have great class and age impressively. The more traditional grape of Grüner Veltliner also excels, with great depth and power to its peppery fruit character. There are three levels within the Wachau’s system of ripeness: Steinfeder, Federspiel and Smaragd. The relatively low-alcohol style of Steinfeder is for early drinking but the best Federspiel are more structured and concentrated and will keep for at least three or four years. The best quality however always comes from the Smaragd examples, named after a little green lizard. German classifications of ripeness are used for sweeter styles (Auslese, Beerenauslese, etc. ), made in small quantities by some growers when conditions permit. Wines from leading vineyards can sometimes be labelled with the vineyard only (Ried Klaus for example) and not the associated village. Behind Spitz are the top sites of Hochrain and Singerriedel, given brilliant expression by Hirtzberger, while Weissenkirchen includes the Steinriegl, Achleiten and Klaus sites close to the village. Further downstream are the particularly favoured steep terraces running from Dürnstein around past Oberloiben and Unterloiben; top vineyards include Kellerberg, Loibner Berg, Schütt and Steinertal but fine examples are also made from several other sites. Wachau merges seamlessly into KREMSTAL, though there is not the same number of outstanding vineyards or producers here. In order to avoid much of what is in fact decidedly ordinary, look for wines from Nigl or Salomon, the latter highlighting the splendour of the Kögl vineyard. Kremstal is included among a number of regions under Austria’s recently established DAC (Districtus Austriae Controllatus) a new regulatory category of controlled origins for the country’s wines and grape varieties which has now being extended to a number of regions, in this case for Grüner Veltliner and Riesling. KAMPTAL (now included as a DAC region also for Grüner Veltliner and Riesling) in the valley of the Kamp is away from the Danube but the potential of vineyards around the wine town of Langenlois is increasingly being realised. Until recently only one producer, Bründlmayer, stood out but there are now several good sources. The top vineyards are Zöbinger Heiligenstein and Strasser Gaisberg from which several producers make good wines. As other excellent producers such as Fred Loimer or Schloss Gobelsburg come to the fore so does recognition of other great vineyard sites including Langenloiser Steinmassl or Kammerner Lamm. TRAISENTAL (now a DAC region for Grüner Veltliner and Riesling), is east of the Wachau and centred on another Danube tributary, the Traisen, was only officially recognised as a distinct wine region in 1995. 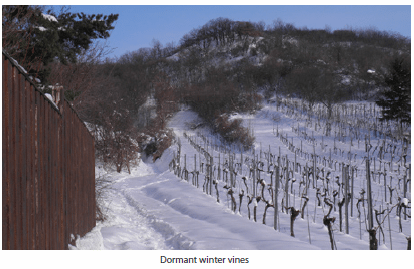 Though it lacks the imposing terraces of the Wachau and it can be more of a struggle to get fully ripe fruit, it does boast at least one good producer in Neumayer. The large region of DONAULAND has two poles of potential quality and sensibly both have recently been given independent regional status. Foremost in quality terms is WAGRAM which adjoins Kamptal. It can be the source of excellent value Grüner Veltliner. Some also do surprisingly well with Pinot Noir. Leading producers include Fritsch, Leth and Ott. At the eastern end of Donauland is KLOSTERNEUBURG which lies just north of Vienna. The historic Stift Klosterneuburg is being stirred back into life with promsing St-Laurent reds and sweet whites. WIEN (Vienna) itself has a lot of land planted to vines for everyday dry whites. However, Wieninger and Zahel produce fine whites from the celebrated Nussberg site. South of the capital is the THERMENREGION, once famous for the sweet whites of Gumpoldskirchen from Zierfandler and Rotgipfler grapes but now making mostly dry whites and reds. Formerly part of Hungary, the edge of Burgenland forms all of Austria’s entire border with its eastern neighbour. The best wines are the sweet whites made around the shores of the Neusiedlersee. On its western shore in NEUSIEDLERSEE-HÜGELLAND, around the town of Rust, the traditional Ausbruch style is made, now generally a full, sweet white with higher alcohol than wines made in the Germanic style (but with a must weight between those of Beerenauslese and TBA). The leading wine town for sweet whites on the eastern shore of the NEUSIEDLERSEE is Illmitz and the lowlying vineyards produce Austria’s most stunning examples, led by those of Kracher. In both regions Welschriesling, Muskat Ottonel, Pinot Blanc, Pinot Gris and Chardonnay are the most important white grapes, with Chardonnay in both sweet and dry styles. In Steiermark, especially SÜDSTEIERMARK close to the Slovenian border, some aromatic, lively whites including Sauvignon Blanc, Chardonnay (here called Morillon) and Gewürztraminer are made. Lighter, unoaked examples are sold as Steirische Klassik. More serious single vineyard efforts from the likes of Gross, Tement or Wohlmuth can be a revelation with a sosphisticated use of oak, and unexpected weight, poise and complexity. These now contrast with the region’s previous reputation for wines with unbalanced alcohol levels and excessive oak. Long-mooted changes in the Austrian wine law have resulted in changes on wine labels. The DAC classification (Districtus Austria Controllatus) has been extended and developed, the process of identifying mapping top vineyard sites is continuing, with the resulting single-vineyard names on labels, and sparkling wines are being more rigorously regulated. First of all, regional names are being simplified: the four regions whose names included Burgenland or Neusidlersee are now all just Burgenland. Secondly, single-vineyard wines must now be labelled Ried plus the name of the vineyard. Thirdly, in Burgenland, all of those sweet wines which were called Ruster Ausbruch are now labelled trockenbeerenauslese wines; only those from the town of Rust itself may be labelled Ruster Ausbruch. And fourthly, sparkling wines (sekt) will have a series of slightly confusing labels, but the thing to remember is that Austrian Sekt with Protected Designation of Origin can be sold only when labelled with one of the defined terms Klassic, Reserve, or Grosse Reserve. In Kamptal, Kremstal, Traisental and Wagram, all part of Niederösterreich (Lower Austria), the Österreichische Traditionsweingüter (Austrian Traditional Wine Estates ) or ÖTW, have, from the 2016 vintage, introduced a three-tier classification system; this, however, for the time being leaves out Wagram, which does not yet have an established DAC system. 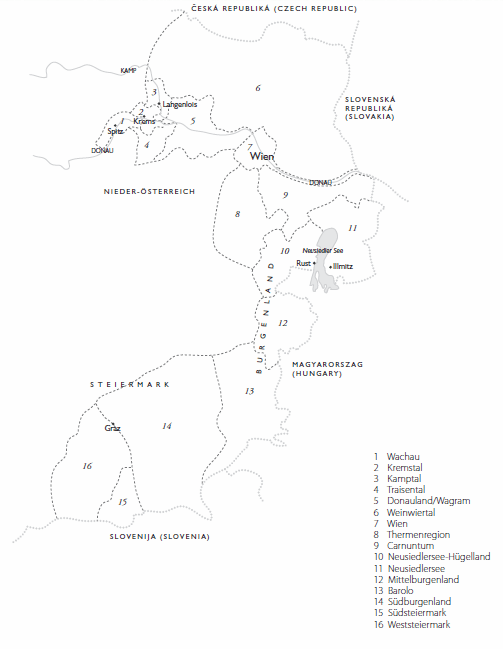 The tiers are Gebietswein, which is a regional wine, such as Kamptal or Kremstal; Ortswein, which is a village wine, such as Langenlois or Spitz; and Riedenwein, which is a single-vineyard wine, such as Gaisberg or Heiligenstein. Within the Ried or single-vineyard classification, work has been going on for some time to identify the best vineyards as Erste Lagen or first growths or premier crus; as of September 2016 there were 62 of them. The intention is also to identify the Grosse Lagen or grand crus. The Erste Lagen wines have 1ÖTW on their labels. The Wachau have their own organisation, the Vinea Wachau Nobilis Districtus, and their own system of quality control. There are three levels: Steinfeder, which is the lightest, may be gently sparkling, and is to be drunk young, has an alcohol level of 11-11.5%; Federspiel, which is made from riper grapes, has an alcohol level of 11.5-12.5%; and Smaragd, made from the ripest grapes, has a minimum alcohol level of 12.5%, and the potential to age. They are normally the highest quality wines. The Vinea Wachau permits only wines made from white grapes in the classification. In the Steiermark in the south, the Styrians have their own association, the Steirische Terroir & Klassic Weingüter, or STK; they have their own vineyard classification system, with Premier Cru STK Vineyards and Grand Cru STK Vineyards.